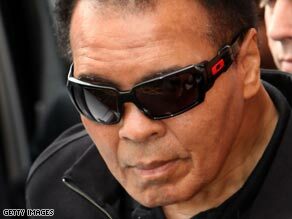 (CNN) -- Legendary American boxer Muhammad Ali has visited the birthplace of his ancestors in Ireland, prompting thousands of well-wishers to line the streets of the town. Muhammad Ali on a nine-day visit to Europe that included a stopover to his ancestral home in Ireland. The scenes were reminiscent of a presidential visit as the 67-year-old former three-times world heavyweight champion traveled to Ennis, County Clare to see the hometown of his forebear. The visit was commemorated by the town council with the unveiling of a plaque at the home of his great-grandfather and by making Ali the first honorary "freeman" of the town. Ali -- who was crowned Sportsman of the Century by Sports Illustrated in 1999 -- had his Irish heritage uncovered by genealogists in 2002. "Now that we know Muhammad is an Ennis man, we will be back," Ali's wife Lonnie told Britain's Daily Telegraph newspaper. The small County Clare town of 23 thousand put on an open-air concert, closed schools early and had special screenings of the Ali versus George Foreman documentary "When We Were Kings" to welcome the "Louisville Lip." Ali -- who has been a Parkinson's Disease sufferer since 1984 -- did not speak to those who had gathered but shadow-boxed to spectators and cameras before meeting his distant relatives. "It was incredible. We've had so much rain, and yet today it was beautiful. The rain held off wherever Muhammad Ali went," Frankie Neylon, the town's mayor said. Ali fought in Ireland only once during his career, beating Al Blue Lewis in a non-title bout at Dublin's Croke Park in 1972. The visit to Ireland was part of a nine-day tour of Europe that Ali had undertaken to raise money to fight Parkinson's Disease and for the Ali Center.